Does your basement leak? 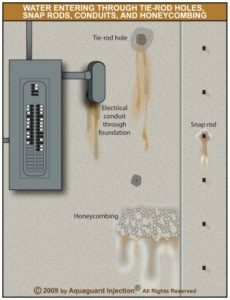 Do you think that your weeping tile is plugged and needs to be replaced? Then this page is for you. Before we can get into a detailed discussion about weeping tile we need to understand why it is installed and how it works. Is it necessary to install new weeping tile? Does replacing weeping tile guarantee a dry basement? A weeping tile system is a simple drainage system installed around your home, next to the exterior side of the footing which is the base of your foundation walls. The purpose of weeping tile, also referred to as drainage tile or drain tile, is to provide a drainage point for draining water that has accumulated at the base of the foundation (the footing), to the storm sewer beneath your street or into a sump pump liner installed beneath your basement floor. Without this ability to drain water at the base of your foundation, your basement foundation wall would effectively sit in a puddle of water for its entire life (depending on the height of the water table of course). Pooling of water at the base of your foundation is a situation to be avoided because, given the porosity of concrete, whether poured concrete, concrete block or cinderblock, the mortar joints and concrete in general will absorb water. Ground water naturally wicks through the concrete and the mortar joints and causes saturation of this concrete and/or mortar which will then soften and weaken over time; thereby gradually weakening and damaging your foundation walls. Installing brand-new weeping tile around the footing of your home will certainly enhance footing drainage. In many instances homeowners agree to having this expensive and destructive basement waterproofing work done and unknowingly waste alot of money because they didn’t actually have a drainage problem to remedy. In actual fact, many basement leaks have little to do with the drainage efficiency of the weeping tile and can be remedied by other less expensive means. It is crucial to understand that, unless the foundation walls are waterproof, a leaking basement will most likely continue to leak; this is because most basement leaks are not really the result of faulty or clogged weeping tile systems. 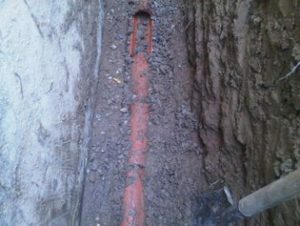 In fact, many new homes with brand new foundations and brand new weeping tile installations still have basement leaks. While this fact may seem illogical at first, further logical examination of this statement will prove that it is accurate. 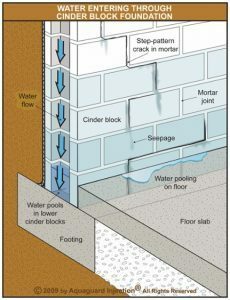 The following three illustrations depict a typical weeping tile installation at the footing of a poured concrete foundation wall, as well as typical basement leaks for poured concrete and concrete block / cinderblock foundations. Water that leaks into a basement through a foundation wall, is, in fact, entering under pressure through voids and cracks in those walls. It is the protection against water ingress through these voids and cracks that ultimately keeps water from leaking through your basement walls. This protection against leaks through voids and cracks is the role of the foundation waterproofing product (coating) applied onto the exterior surface of the foundation walls. Installing new weeping tile enhances your foundation’s ability to drain away accumulated water present at the base of the foundation. Efficient weeping tile drainage does help reduce the amount of water pressure against your foundation and therefore the frequency of leaks and amount of water that will leak through the foundation walls. 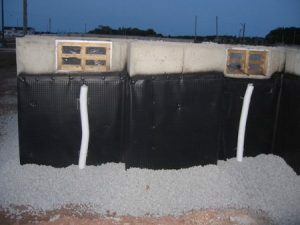 In new home construction, poured concrete and cinderblock, or concrete block, walls are “dampproofed” using an application of sprayed-on tar and sometimes air-gap membrane (or foundation wrap – the purpose of which is solely damp proofing) is also installed. Even though a brand new foundation has been dampproofed with tar, which is usually applied as thin as paint, once a crack develops, the thin tar application doesn’t stretch to bridge the width of the crack. 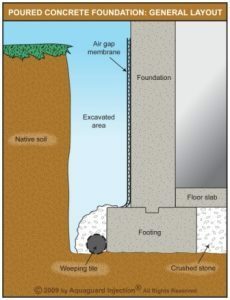 As a result, the foundation is not waterproof because there is now an unprotected gap in the foundation. 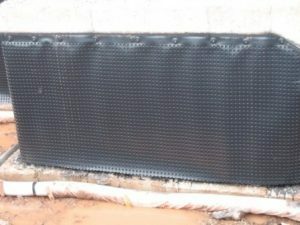 Installed air-gap membrane doesn’t protect against leaks as the purpose of this membrane is solely to provide dampproofing; specifically for the purpose of keeping wet mud from being in constant contact with your foundation walls. Notwithstanding the presence of perfectly installed and perfectly clear weeping tile, there remains significant hydrostatic pressure against your foundation, especially where clay soils are involved (this applies to most areas in the GTA with the exception of areas closest to Lake Ontario). If there is no barrier preventing this pressure from causing water to enter a foundation crack or void, then water will flow through your foundation walls and result in a wet basement. If the soil retains so much water which does not reach the weeping tile, how critical is replacing weeping tile? When waterproofing your exterior foundation walls it is necessary to excavate those walls down to the footing (the very base of the wall). With the exterior foundation walls fully exposed, it would make no sense to forego the installation of brand new weeping tile, if only to replace partially blocked weeping tile along the area being excavated. If you are excavating your foundation walls then you may as well replace the weeping tile along the excavated area. Before you agree to spend thousands of dollars to excavate your foundation and install new weeping tile, whether along one section of the foundation, or around the entire home, you should know that your current weeping tile does have secondary drainage. 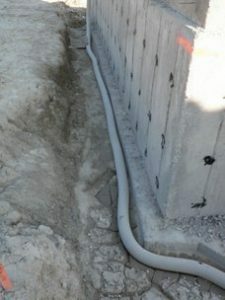 This secondary drainage is provided by a gravel layer that surrounds the weeping tile; the current building code calls for 2 ft³ of gravel per linear foot of weeping tile. Because your weeping tile system has help in draining the water pooled around your home’s footing, a new weeping tile installation may actually provide little enhancement to the current drainage efficiency of your existing weeping tile system. Below is a picture of the gravel layer installed for a newly constructed home. Homeowners should keep in mind that excavating and waterproofing a foundation, which should always include the installation of new weeping tile, typically costs thousands of dollars (often 10’s of 1000’s). Therefore, the profit margin associated with excavation and waterproofing activities is significant. 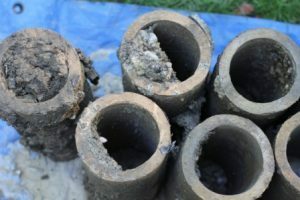 This is one major reason why exterior excavation and waterproofing is typically proposed, to most homeowners that have requested an estimate, for resolving basement leaks. It is clear that the installation of new weeping tile is not necessarily the “must do” solution for preventing and stopping basement leaks. In virtually all cases there are much more cost effective ways to put an end to basement leaks such as internal de-watering / perimeter drainage systems, crack injections etc. Know the repair options and, if you are so inclined, you decide what waterproofing solution you will choose. 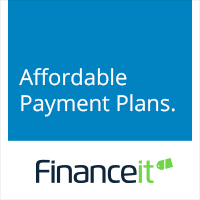 An informed consumer is less likely to be bullied or intimidated into accepting a basement waterproofing solution they don’t need or really can’t afford.